The JVP said that the government was silent on small extremist groups who sowed ethnic hatred in the country to draw attention away from the sky rocketing cost of living and other burdens, which had become unbearable to people. Addressing a rally after opening a political office in Batticaloa, JVP General Secretary Tilvin Silva alleged that recent violence in Alutgama had been caused by an outside group sponsored by the government. “We say this with responsibility that the government sponsored extremist groups created violence in Alutgama and the police were helpless to prevent it,” he said. Silva said that the people of the country did not need ethnic violence. As the people urgently needed to address the problems already overwhelming them, including sky rocketing cost of living, abuse of public funds by those holding power for unnecessary projects, wide spread corruption etc. However, the Sinhala, Tamil and Muslim leaders were busy selling racism, while being in the government to collect votes. Example were Champika Ranawaka and Wimal Weerawansa were spreading Sinhala racism, while Karuna Amman, Thondaman and Douglas Devananda Tamil racism to collect votes, Silva said adding that Muslim leaders like Rauff Hakeem collected Muslim votes by spreading racism while continuing to be with the government betraying their voters. 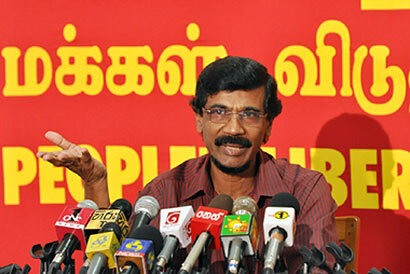 “There is no point in joining racist parties based on particular ethnic groups,” the JVP General Secretary said asking people to choose parties that had all races Sinhala, Tamil and Muslims.